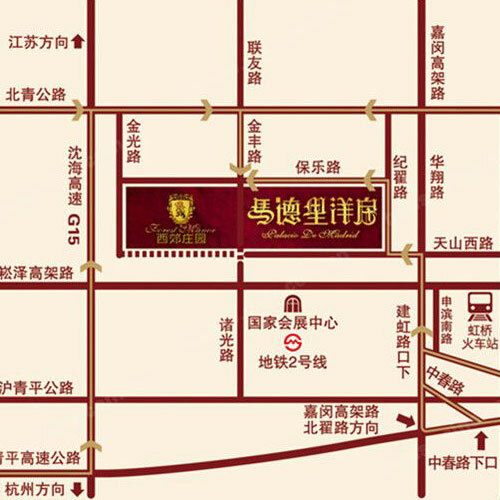 There are tons of gated communities on the outskirts of Shanghai, each offering its own brand of opulence, and frequently with a western aesthetic. One example of this is 马德里洋房, or “Madrid Western Houses.” I can barely make out the English name in the image below, but I think maybe it reads “Palacio de Madrid”? Considering that most Chinese don’t read Spanish, this name is pushing for new heights in pretentiousness. Rather than apartments, or 公寓 (where most Chinese live), this community offers stand-alone houses with small yards. These are generally referred to as 别墅 in Chinese (a word frequently translated as “villa” in English, but which is often used in Chinese marketing speak to make clear that these are not apartments). Sorry the image quality isn’t too good; this is the best I could dig up. Has anyone out there seen any other medieval gothic Chinese?